Following Flashpoint, all DC titles will be renumbered and relaunched with new #1 issues. There has been a mixed to negative reaction to various parts of this announcement, with most negativity focused on the continuity changes. The new continuity dubbed the DCnU will have new outifts, back history, and stories for many of its long established heroes and villans. The fate of many characters is still unknown and it is expected that several characters may simply be 'erased' and cease to exist in the DCnU. 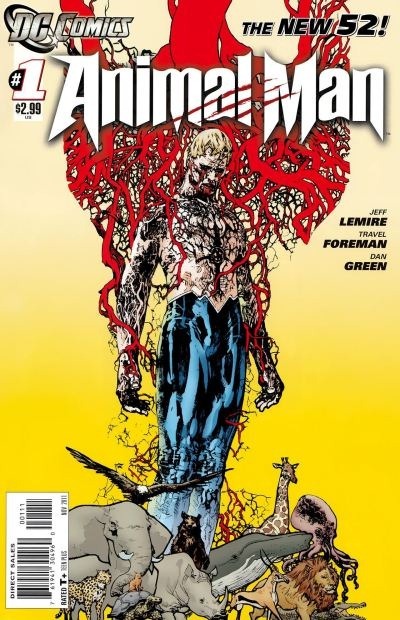 I'm really psyched about some of this, especially the relaunch of Animal Man, written by Jeff Lemire and drawn by Travel Foreman and Dan Green. DC comics were alright , but to my warped tastes I preferred the EC comics brand. My oldest cousin, with whom I lived for a few years after my birth, collected EC comics in the 1950's. He went into the MArines in the 1960's and left me all his comics. I have approximately 5 years of all the "Tales from the Crypt" and "The Vault of Horror". These wre comic books well designed to make you carp in your pants. I have them in plastic sleeves and about every ten years I take em out to marvel at the art and story lines. EC comics were, I am happy to report, the principal reason for Congress'e interference into kids magazines that ultimately led to the "Comics Code". These comics were popular in the 1940's and 1950's and died at the end of the 50's when the comics code required the sanitization of crime, war, and horror magazines. If it werent for the cheap newsprint that they ran em on, these things would be worth a fortune. The original MAD magazine was an EC product also and it, just like the original NATIONAL LAMPOON, was a really warped, truly inspired , and brilliant humor mah. SO, when they decide to rerun EC comics, I will be there. The comics market has changed so drastically from the times I bought and read them, I am now a novice where characters and story lines are concerned. Early on, my brother Sam detected the growing trend to collect them at a profit and bought off the rack as many copies as he could of #1 Spiderman, Hulk, Fantastic Four and others. He was mainly focused on Marvel, because that was where the action happened to be those years. Later, he opened a collectibles store in Providence. He did well there for a considerable time, until he miscalculated and decided to sell the store in favor of opening a video store. The needed cash flow from the sale of the store for the new one failed to materialize and he went out of business. I grew up with DC comics. 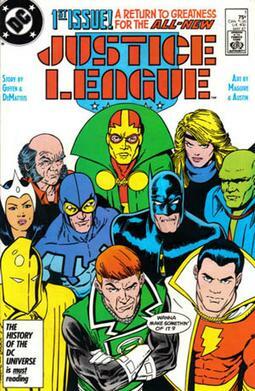 Justice League of America was my favorite.